A senior delegation from WC2 member, Ryerson University, in Toronto, Canada has visited City, University of London to affirm and expand the partnership between the universities through the signing of a Memorandum of Understanding. Ryerson is home to Canada's largest undergraduate business school with nearly 10,000 students, as well as DMZ, the number one university-based business incubator in the world. DMZ has nurtured 325 startups since it was set up in 2010. Ryerson is also in the process of establishing a Law School, with the first intake of students scheduled to begin in 2020. 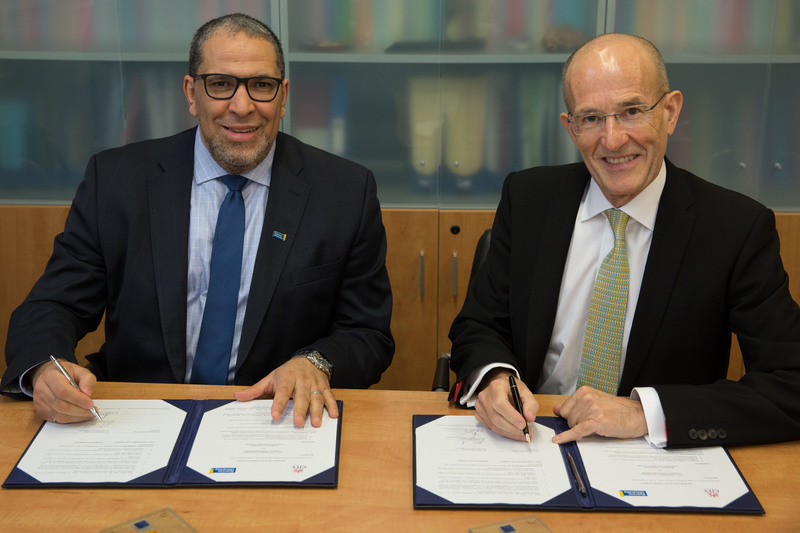 The Ryerson delegation was led by their President, Mohamed Lachemi and met with the President of City, Professor Sir Paul Curran (pictured) to sign the MoU. Vice-President (International), Professor Stanton Newman as well as representatives from each of City’s Schools were also in attendance. It was agreed that opportunities for collaborative research, funding and publications would be explored, particularly in the areas of journalism, cybersecurity and media and communications. Establishing an exchange programme for School of Health Sciences’ students was also discussed. Ryerson is an important partner for City and this agreement opens up many opportunities to extend our collaboration, particularly with SASS and SMECSE. Ryerson University will host the fourth WC2 Symposium in August 2018. The Symposium is the annual meeting of the WC2 network, which was founded by City, University of London in 2010. Ten universities, located in the heart of major world cities make up the network which collectively explores cultural, environmental and political issues of common interest.